You may freely use this data for developing SLAM or interpretation algorithms, but you are required to name the people, who recorded the data set and their correponding institution. Description The two scans are intended as an input for change detection algorithms. The scans are taken from different vantage points and one scan contains two people while the other one does not. by Dorit Borrmann, Helge Lauterbach, Sven Jörissen from the University of Würzburg, Germany and Marija Seder from the University of Zagreb (FER), Croatia. 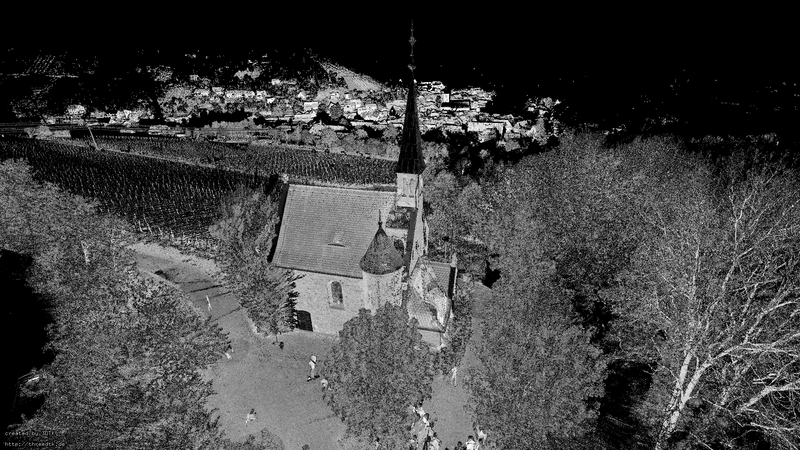 This data set was recorded using a Riegl VZ-400. 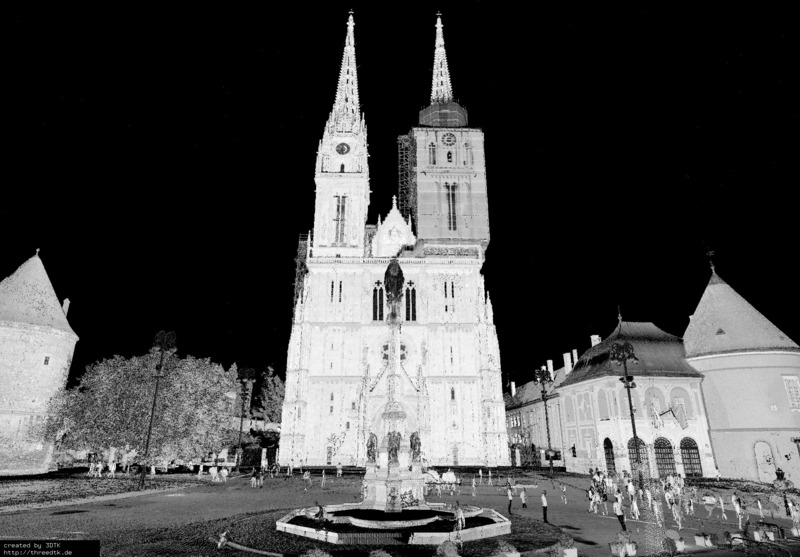 It contains eight 3D scans taken in front of the cathedral in Zagreb, Croatia.. Each scan has up to 22,500,000 points with reflectance values. You can download the complete data set with the 3D scans and rough initial pose estimates acquired by manual registration and the graph file for registering the data. The final poses are computed by slam6D. Further information can be found in the README. by Dorit Borrmann and Andreas Nüchter from Jacobs University Bremen gGmbH, Germany. This data set was recorded using a Riegl VZ-400 and a Optris PI IR camera. 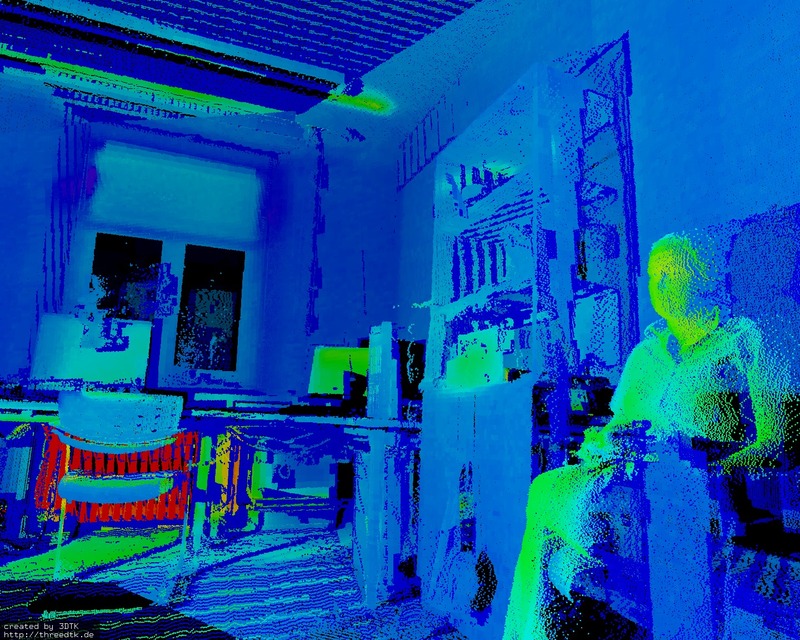 It contains several 3D scans taken at a residential house in Germany. The data set contains two parts. 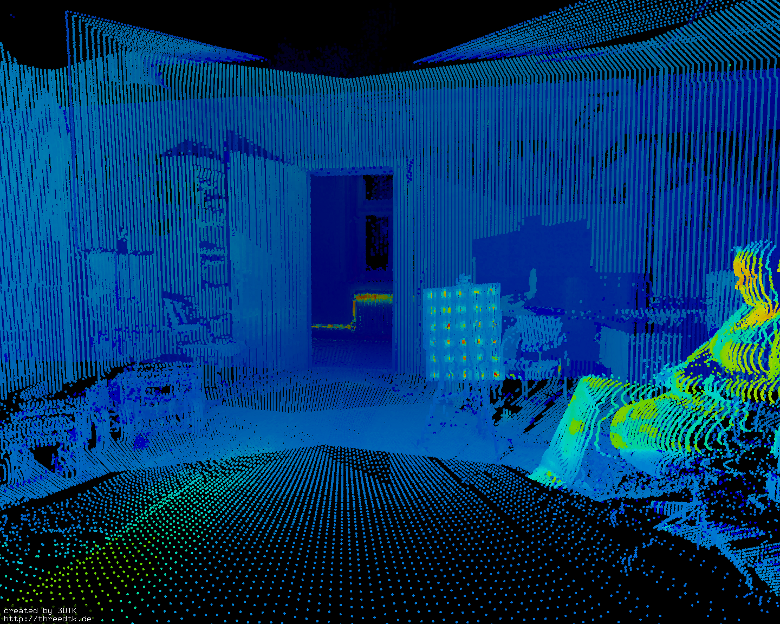 (a) The outside view of the house consisting of data collected at 11 different poses. 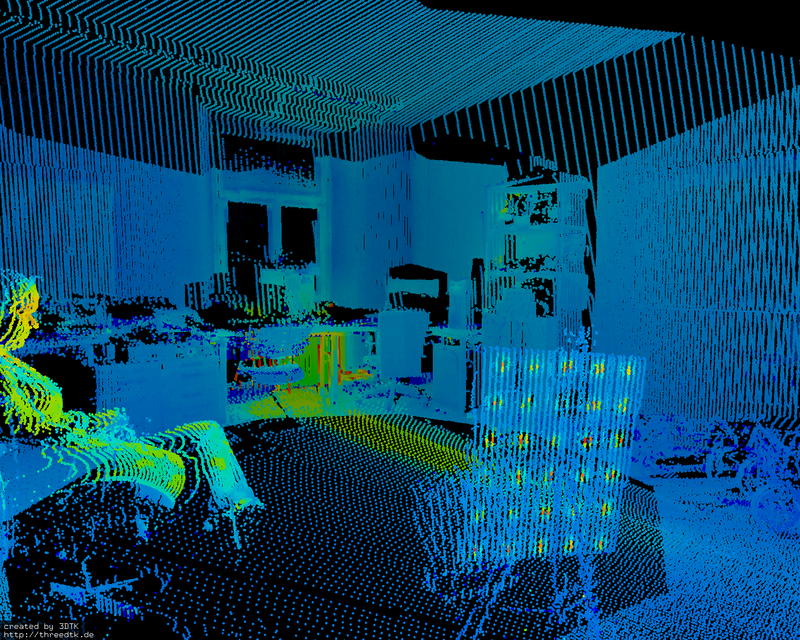 (b) The inside view of the house consisting of data collected at 17 different poses on the ground floor. 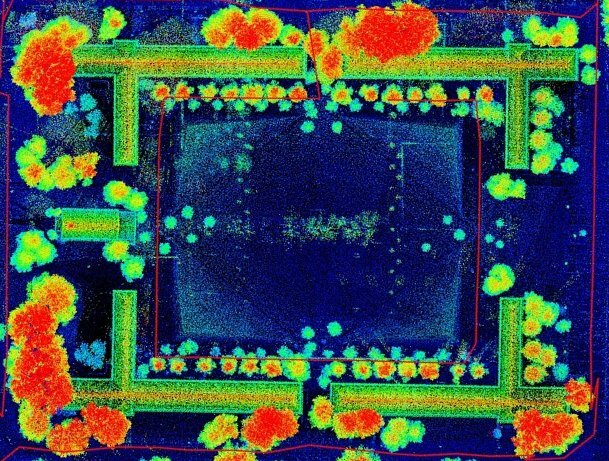 The points from the laser scans are attributed with the thermal information from the camera. Pose files are calculated using 3DTK based on odometry information. Note: Inside and outside view are not registered into one common coordinate system. You can download the inside data set and the outside data set. Further information can be found in the README. This data set was recorded using a Riegl VZ-400 and a Optris PI IR camera. 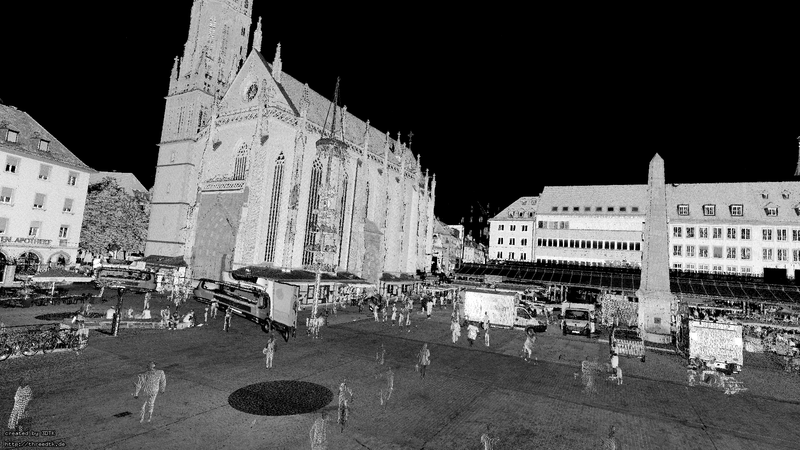 It contains several 3D scans taken in the city center of Bremen, Germany. The data set consists of data collected at 11 different poses. 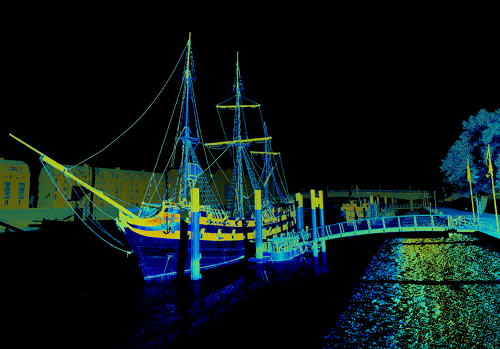 The points from the laser scans are attributed with the thermal information from the camera. Pose files are calculated using 3DTK based on odometry information. You can download the complete data set Further information can be found in the README. This data set was recorded using a Riegl VZ-400 and a Optris PI IR camera. 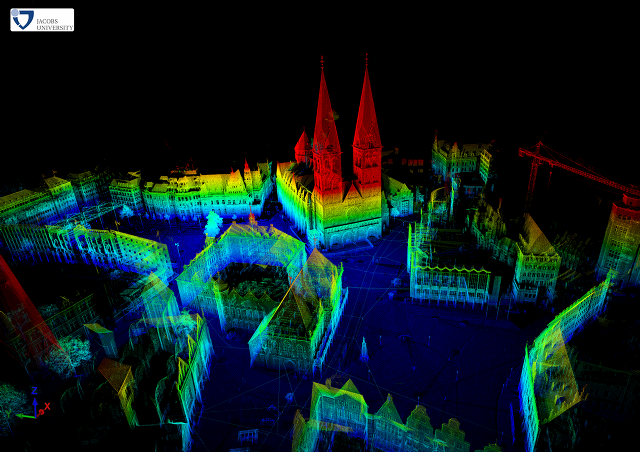 It contains several 3D scans taken in downtown Bremen around the Gaussian Point, the central point of the first cartography of Bremen and its surroundings. The data set consists of data collected at 3 different poses. 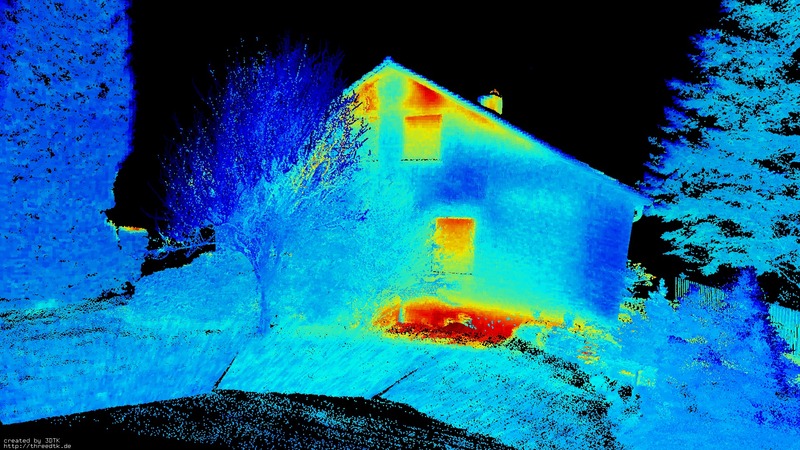 The points from the laser scans are attributed with the thermal information from the camera. Pose files are calculated using 3DTK based on odometry information. You can download the complete data set Further information can be found in the README. by Dorit Borrmann from Jacobs University Bremen gGmbH, Germany. This data set was recorded using a Riegl VZ-400, a Optris PI IR camera and a Logitech QuickCam 9000 Pro camera. 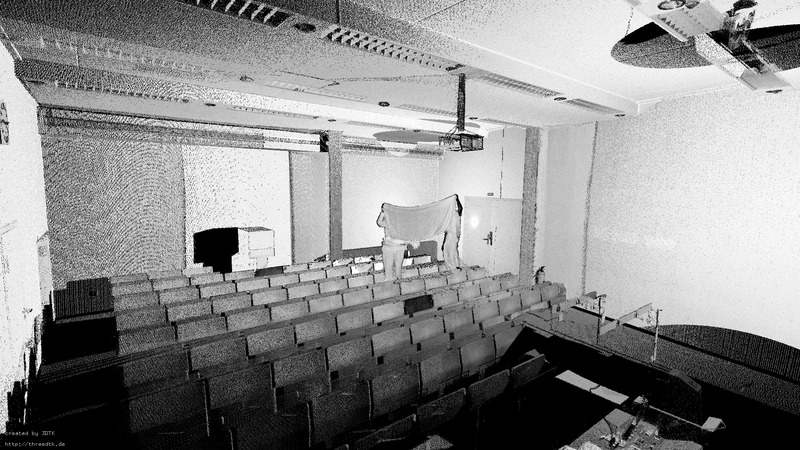 It contains several 3D scans taken around the Automation Lab at Jacobs University Bremen. The data set consists of data collected at different poses. 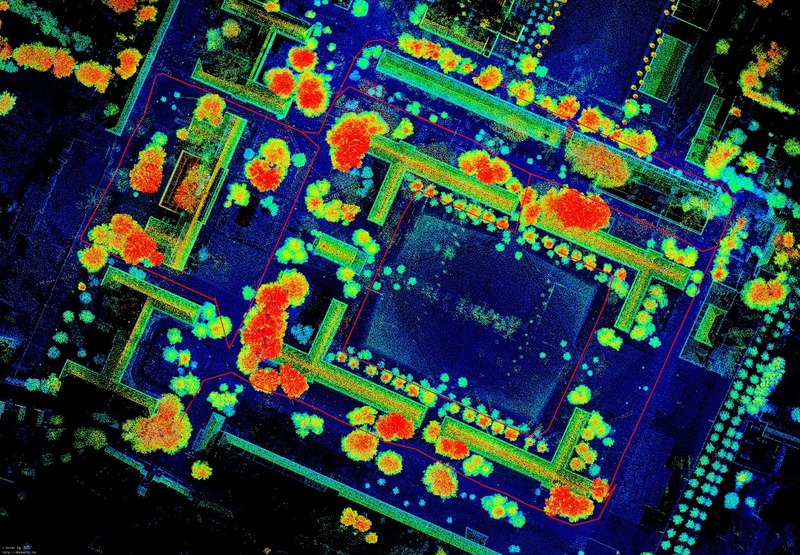 The points from the laser scans are attributed with the thermal information and color information from the cameras. Pose files are calculated using 3DTK based on odometry information. You can download the complete data set Further information can be found in the README. by Dorit Borrmann, Jan Elseberg, HamidReza Houshiar, and Andreas Nüchter from Jacobs University Bremen gGmbH, Germany. 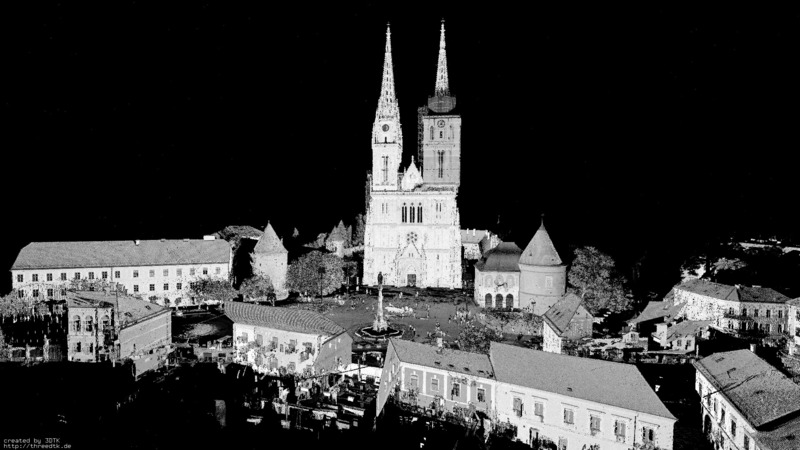 This data set was recorded using a Riegl VZ-400 and a Canon 1000D camera with 10 Megapixel. 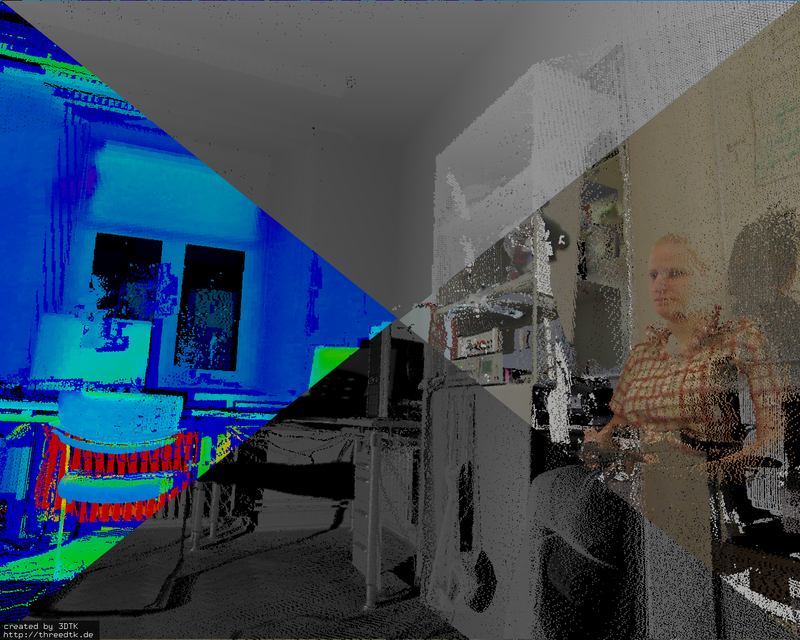 The camera has been co-calibrated with the scanner, such that a color is mapped to the 3D points of the laser scanner. 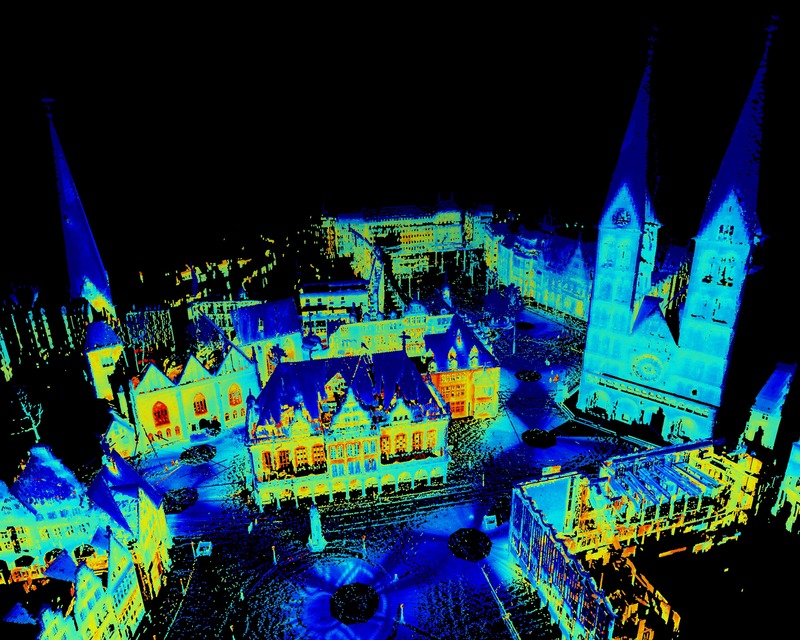 The complete data set is given as text file (x,y,z,r,g,b) using Riegl's coordinate system definitions as well as in the .las format. by Prashant K.C., Dorit Borrmann, Jan Elseberg, and Andreas Nüchter from Jacobs University Bremen gGmbH, Germany. 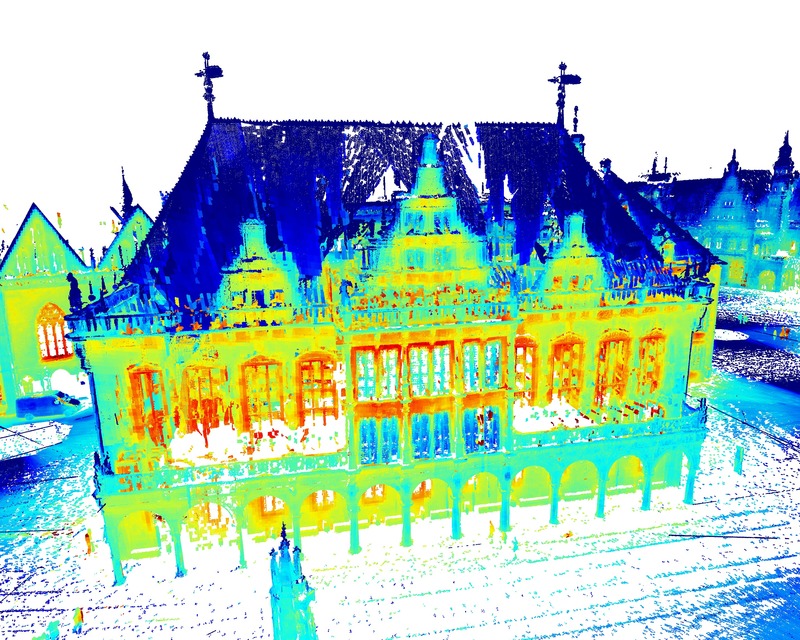 This data set was recorded using a Riegl VZ-400 on the campus of the Jacobs University Bremen. 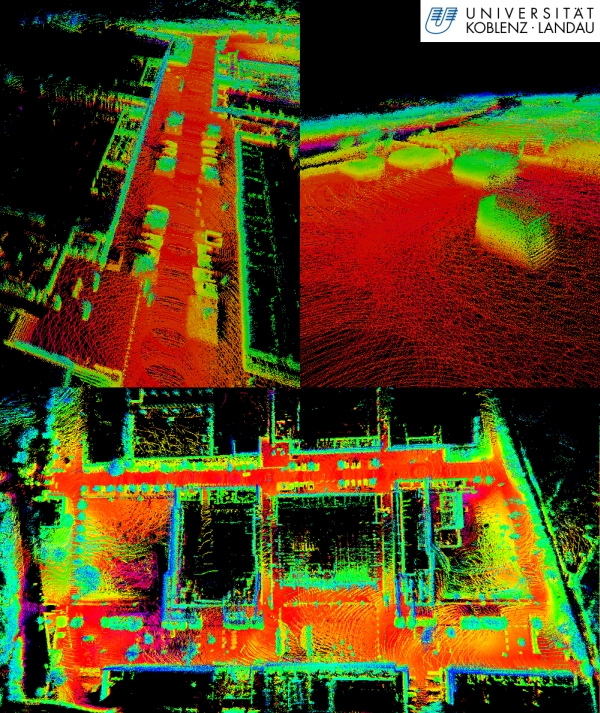 The data set contains 3D scans, covers almost all of the campus and is therefore quite large (122 scans @ 1.2 Gb each). Using reflective markers, the scans were manually registered. 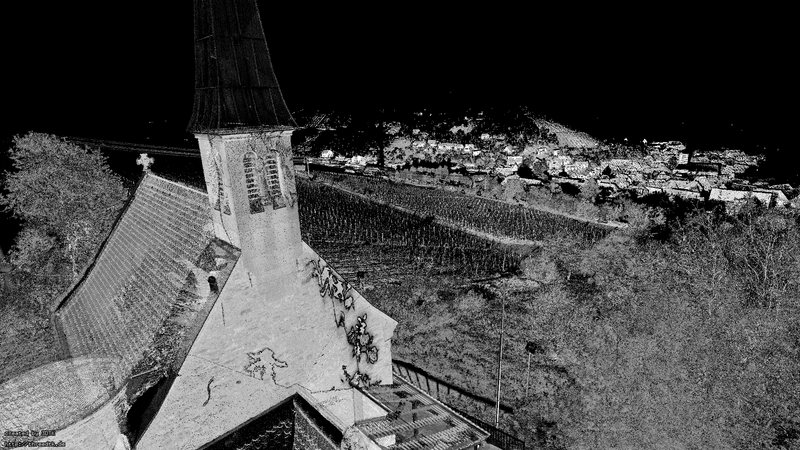 You can download the complete data set containing the point clouds and the poses obtained from the manual registration. In addition, we provide the accurate registration that was computed using 3DTK. See this README for instructions on how to match the data set. by Dorit Borrmann, and Hassan Afzal from Jacobs University Bremen gGmbH, Germany. This data set was recorded using a Riegl VZ-400 and a Optris PI IR camera. It contains several 3D scans taken around the Automation Lab at Jacobs University Bremen. 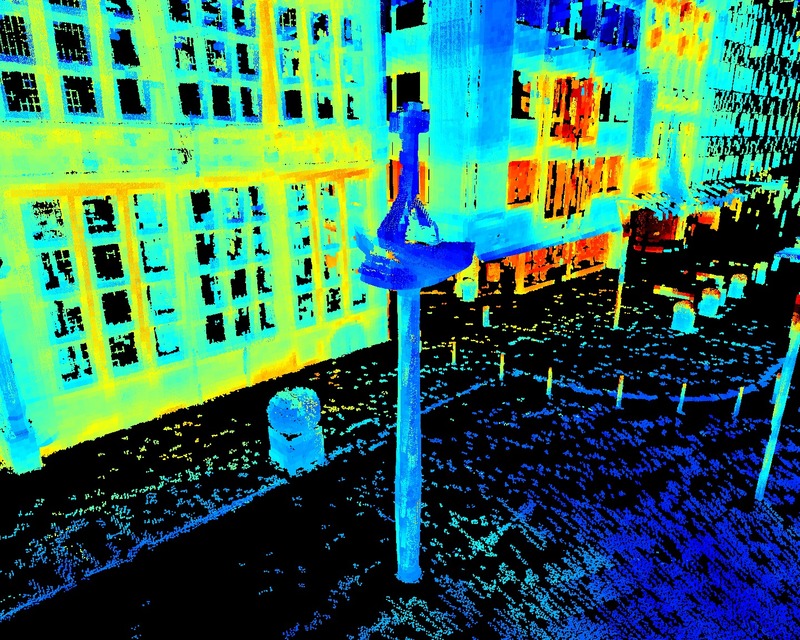 The data set consists of scans and thermal images taken at different poses. 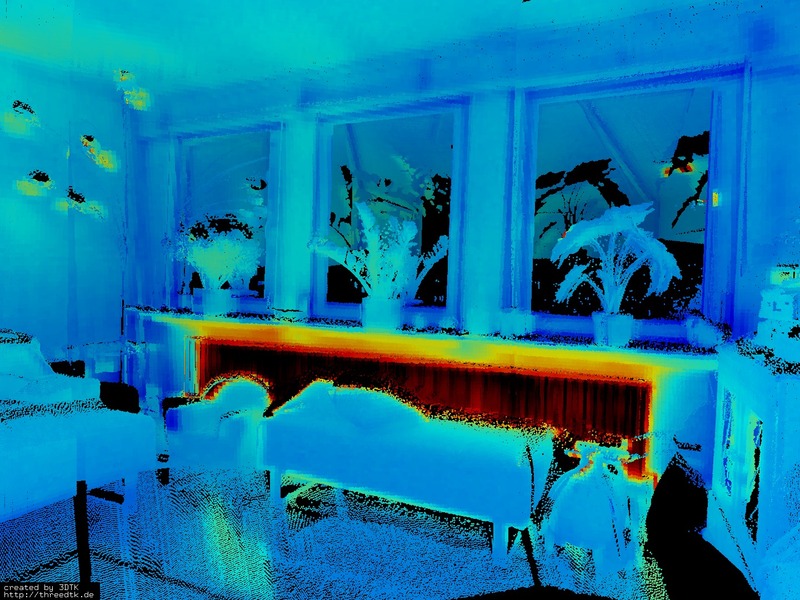 You can download the complete data set containing the point cloud colored with the thermal information and the poses obtained from odometry. In addition, we provide the original data and the calibration parameters. Further information can be found in the README. by Dorit Borrmann, and Jan Elseberg, and Andreas Nüchter from Jacobs University Bremen gGmbH, Germany. This data set was recorded using a Riegl VZ-400, it contains several 3D scans taken at the Schlachte in Bremen. In addition, we provide manually registrations using markers. You can download the data set in two parts here: part 1 and part 2. Further information can be found in the description of the Bremen City data sets. 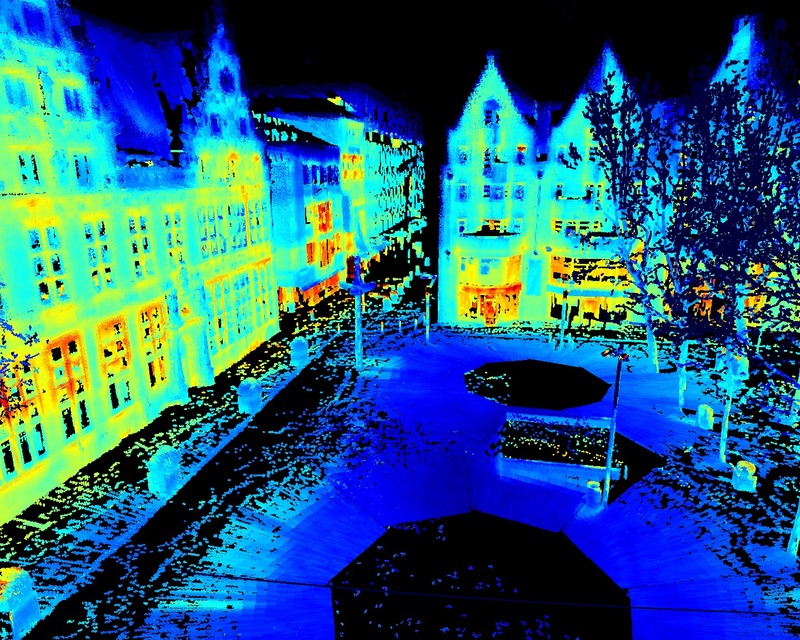 This data set was recorded using a Riegl VZ-400 in December 2009. It contains several 3D scans that have been registered manually using a marker-based approach. The registration has be visially inspected and verified. You can download the complete data set. Furthermore, we provide a README (Bremen city data set) file and the poses obtained using markers. by Johannes Pellenz (WTD 51, Koblenz, Germany), Frank Neuhaus, Denis Dillenberger and Dagmar Lang (Active Vision Group, University of Koblenz-Landau, Germany). This data set was recorded using a Velodyne HDL-64E S2 during the Response Robot Evaluation Exercise in March 2010 in Disaster City, College Station, Texas (USA). The Velodyne 3D LRF data was captured with 10 Hz, the IMU data with 100 Hz, the GPS data with 1 Hz and the camera data with 30 Hz (MJPG compressed). The dataset features several loops around Disaster City (on roads and through rough terrain with slopes). The full logfile is available in the Koblenz file format, containing all the above mentioned sensor data. Acknowledgements: We thank Robert Bolling and Chris Scrapper from The MITRE Corporation for providing the robot Centaur and the sensors. by Johannes Pellenz, and Dagmar Lang (Active Vision Group, University of Koblenz-Landau, Germany). The scans of one Velodyne revolution per second, following the data format used in Osnabrück. The full logfile in Koblenz file format, containing all the above mentioned sensor data. This file format is specified in the README file. by Dorit Borrmann, and Jan Elseberg from Jacobs University Bremen gGmbH, Germany. 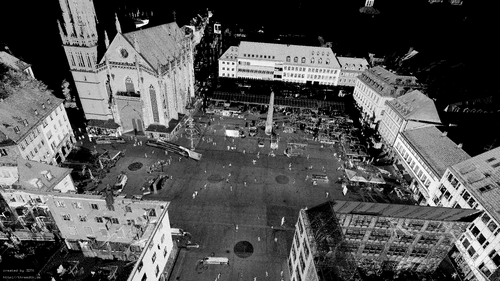 This data set was recorded using a Riegl VZ400 Scanner in the city center of Bremen. The single 3D scans have been initally merged using markers as tiepoints, but the result can be improved using slam6D. In the following linked pdf-files the changes are visable ([PDF] Riegl markers as tie points, [PDF] slam6D matching. You can download the complete data set. Furthermore, we provide a README file and the final poses are computed by slam6D. by Stefan Fuchs, Institute of Robotics and Mechatronics, German Aerospace Center (DLR), Germany. This data set was recorded using a Swissranger in a controlled environment in the Institute of Robotics and Mechatronics at the German Aerospace Center (DLR). The data set contains filtered 3D point clouds as well as initial start guesses computed via feature matching using the reflectance images. The files are converted into slam6D files. You can download the complete data set. The the data set above contains filteres data, please consult Stefan Fuchs' webpage for the original data. The data was acquired using a KUKA manipulator moving on a circular path with a diameter of 180mm. The 180 files contain the complete loop, thus featuring steps of 2 degree. by Martin Magnusson, AASS, Örebro University, Sweden. This data set was recorded in the AASS building. It contains 60 3D scans in wrl format. The archive contains a README-file and a pose file for the scans. You can download the complete data set. by Oliver Wulf, Leibniz University, Hannover, Germany. This data set was recorded at the University Campus. It contains 924 3D scans, covering a trajectory of about 1.24 km. 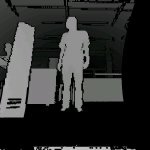 Each 3D scan contains approx. 16,600 data points. The single 3D scans as well as initial pose estimates are given. You can download the complete data set. Please refer to README for further information about the file formats. This data set was recorded at the University Campus. It contains 468 3D scans, each with approx. 20,000 data point. The single 3D scans as well as initial pose estimates are given. You can download the complete data set or parts of it. Please refer to the file README for further information about the file formats. For the above two data sets Hannover1 and Hannover2 ground truth data is availabe on request. Please contact Andreas Nüchter to get this data. For the area ground truth data in form of a 2D map provided by the German land registry office (Katasteramt) is available. This map contains the buildings with a precision of 1 cm. In addition, we obtained airborne based 3D data. 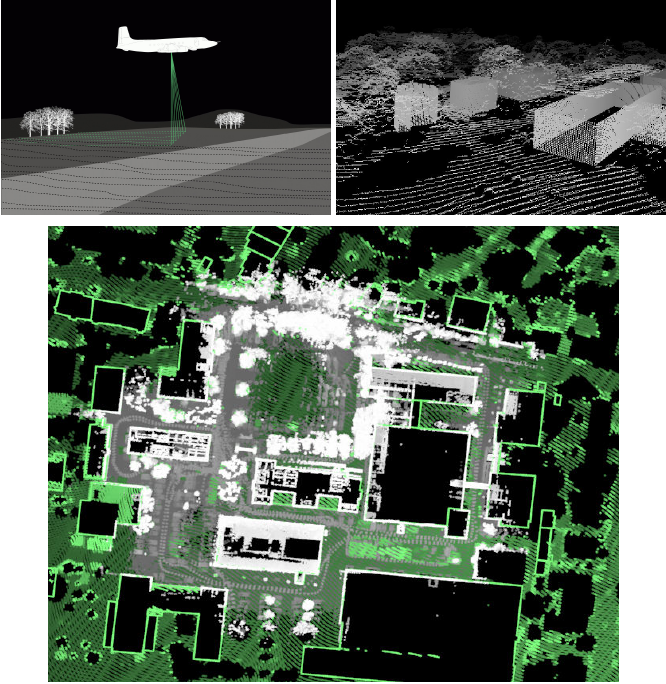 Based on this data so-called reference data is generated as follows (see Figure below): The 2D map is extrapolated to 3D by vertical 3D points and fused with the 3D data from the airplane. The result is a precise 3D reference map. Using this 3D reference map, we generate ground truth poses for all 3D laser scans by matching the scans with the reference map. 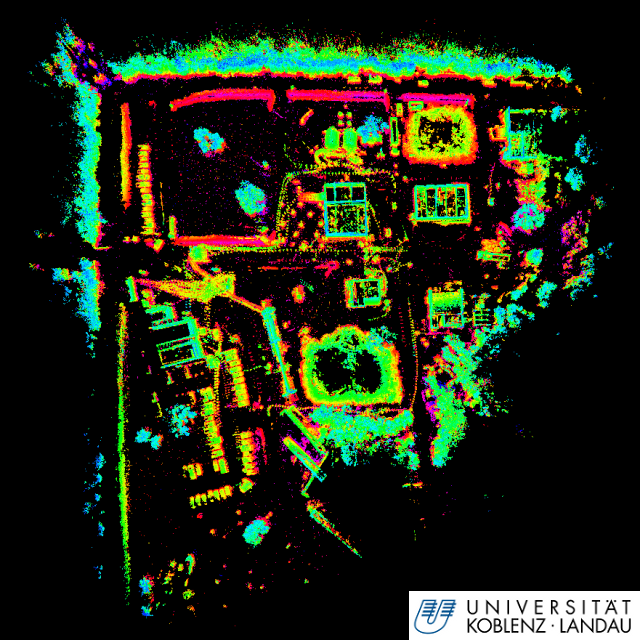 We thank Claus Brenner (Leibniz University of Hannover) for letting us use the airborne 3D data. by Andreas Nüchter and Kai Lingemann, University of Osnabrück, Germany. This data set was recorded at Dagstuhl castle, during the workshop Towards Affordance-Based Robot Control. 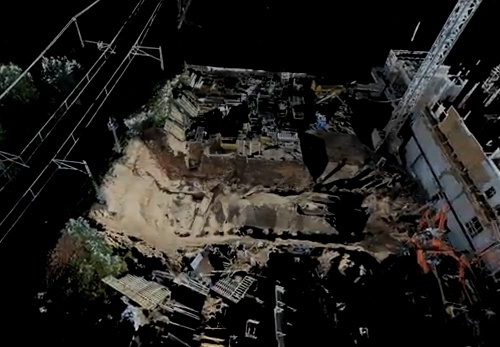 It contains 82 3D scans, each with 81,360 data point. The single 3D scans and a precise 6D pose information are given. You can download the complete data set or parts of it. Please refer to the file README for further information about the file formats. by Martin Magnusson (AASS, Örebro, Sweden), Andreas Nüchter (University of Osnabrück, Germany) and Christopher Lörken (University of Osnabrück, Germany). This data set was recorded at the Kvarntorp mine, near to Örebro, Sweden. It contains the data of 4 independent robot runs with over 250 3D scans, each with 81,360 data points. The single 3D scans and a pose estimte by odometry (2D) are given. You can download the complete data set. Please refer to the file README for further information about the file formats. by Dorit Borrmann, Jan Elseberg, Andreas Nüchter, and Kai Lingemann (all University of Osnabrück, Germany). 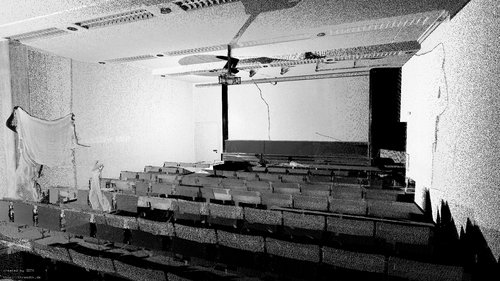 This data set was recorded at the AVZ building of University of Osnabrück, Germany. It contains the data of 63 3D scans, each with 81.360 data points. The single 3D scans and a pose estimte by odometry (2D) are given. You can download the complete data set, including a readme file. It contains two closed loops. by Johannes Pellenz, and Peter Schneider (University of Koblenz-Landau, Germany). by Hartmut Surmann (Fraunhofer IAIS, Sankt Augustin, Germany), Andreas Nüchter (University of Osnabrück, Germany) and Kai Lingemann (University of Osnabrück, Germany). This data set was recorded at the Fraunhofer Campus Sankt Augustin, Germany. It contains the data of 76 3D scans, each with 81.360 data point. The single 3D scans and a pose estimte by odometry (2D) are given. You can download the complete data set. Please refer to the file README for further information about the file formats. by Andreas Nüchter University of Osnabrück, Germany. This data set was recorded at the University of Osnabrück, Germany. It contains 29 3D scans and each 3D scan was recorded with remission values. This value quantifies the amount of light that was returned to the scanner, i.e., a grey value. This data set has been used to evaluate object detection functions. You can download the complete data set. Please refer to the file README for further information about the file formats. This data set was recorded at the Fraunhofer Campus Sankt Augustin, Germany. It contains 100 3D scans of one or two human and each 3D scan was recorded with remission values. This value quantifies the amount of light that was returned to the scanner, i.e., a grey value. This data set has been used to learn the 3D object human. You can download the complete data set. Please refer to the file README for further information about the file formats.